It’s remarkable how something like a simple phone call can lift one’s spirits and alter a life. For Heather Kashman, a 23-year-old Métis from Edmonton, that phone call came last month. Kashman, a star hockey player, received a mid-October call telling her she was one of 14 recipients for the 2017 Indspire Awards. The awards honour outstanding Indigenous Canadians in a number of fields. Kashman is being honoured via the Sports category. She will be recognized along with the 13 other winners at a ceremony in Ottawa on March 24. 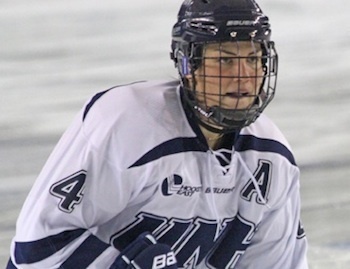 Kashman, who was born and raised in Edmonton, completed her hockey collegiate career earlier this year with the University of New Hampshire women’s squad. Though she had aspirations to play pro, Kashman has been forced to retire, primarily due to a serious back injury she suffered in the fall of 2015 but also because of a long-time nagging hip injury. Earlier this fall Kashman admits she was in a funk and not just because she wasn’t able to play hockey any longer. Being a recent university graduate, she was getting tons of job interviews but was becoming increasingly disappointed at not landing employment. She only had a limited amount of time remaining to find a job or she would be forced to return to Canada. Needless to say, Kashman was getting increasingly despondent about her job prospects. Then came the call from Indspire Award officials. Shortly thereafter she successfully landed a job. Earlier this month she began working for a non-profit organization that helps homeless families find permanent housing in Brockton, Massachusetts. Kashman’s undergraduate degree from the University of New Hampshire was in Business. She then completed her Master’s degree in Community Development and Public Housing from the university, graduating on Sept. 1. Kashman plans to be in the nation’s capital next March to accept her Indspire Award in person. Jesse Scott, who had coached Kashman at various Alberta Native Hockey provincial championships while she was growing up, nominated her for the award. Kashman started to do a bit of research on the award when she found out her former coach was keen to nominate her. She discovered the 2016 Indspire Award winner for Sports was Montreal Canadiens’ star goalie Carey Price. Scott not only went ahead with the application, but Kashman ended up being declared the winner for the Sports category. “I just started crying when I found out,” she said. Kashman is still having a tough time comprehending she will receive an award not only that was previously won by Price but by several other outstanding Native athletes. Kashman said she wasn’t sure if she fit into the group of this year’s recipients since some of them had lengthy successful careers in their fields. This year’s recipients include Senator Murray Sinclair from the St. Peters Indian Reserve in Manitoba. Called to the Manitoba Bar in 1980, Sinclair went on to become the chair of Canada’s Indian Residential Schools Truth and Reconciliation Commission in 2009. Sinclair will be honored with an Indspire Award through the Lifetime Achievement category. The other categories recipients will be honoured in are Arts, Business and Commerce, Culture, Heritage and Spirituality, Education, Health, Law and Justice, Politics and Public Service. There are also three Youth recipients who will be recognized. Roberta Jamieson, the President and CEO of Indspire, said all of this year’s winners are deserving of their accolade. “The 2017 Indspire Awards recipients personify the successes Indigenous people have achieved and the significant impact we have made in all areas of life in Canada,” she said in a news release.